Click here to view full certificate. MeasurIT Technologies Ltd. continuously strives to meet the needs of its customers. 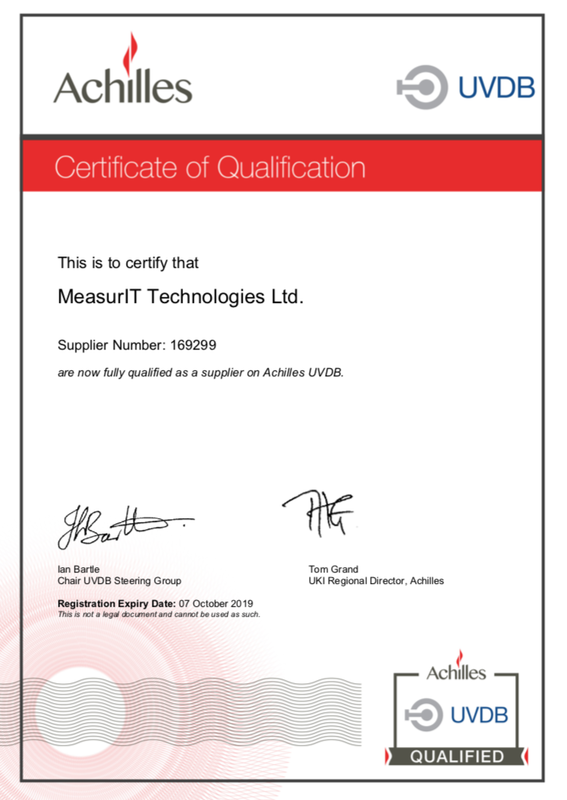 We are pleased to be registered as part of Achilles' proven supplier pre-qualification system. Achilles creates and manages a global network of collaborative industry communities, allowing trading partners to share high quality, structured, real-time data. Using cloud-based technology, Achilles acts as an independent partner providing validated data and insightful analytics to enable buyers to manage risk, and suppliers to increase market reach in their sector. Launched in 1996, Achilles UVDB is the largest Achilles community that is also used by the airports and ports sector. Achilles UVDB is managed by a Steering Group comprising of utility buyers to drive industry best practice.